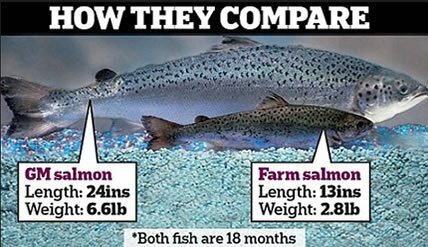 The FDA just approved GMO salmon, the first genetically engineered animal for direct human consumption. This approval was flawed, irresponsible and most likely illegal. Once again the FDA relied only on industry-funded studies provided by Aquabounty, the entity that will profit most from its approval. The science was so shoddy that they used sample sizes so small that they have no scientific credibility, with only 12 fish tested for one study, while another study on possible allergic reactions in humans involved only 6 fish! Despite this shoddy evidence, the Obama FDA approved AqauBounty’s GMO salmon anyway. The law of the land is the 1958 FDCA - Food, Drug, Cosmetic Act. It MANDATES that anything new put into our foods (drugs, etc) MUST be assumed unsafe until scientifically PROVEN to be safe through multiple levels of scientific testing. That means, published (not secret "proprietary information" unreleased) replicable testing for short AND long term safety. This means every GMO in our entire food supply is against the law. Don't label GMOs - KILL THEM.